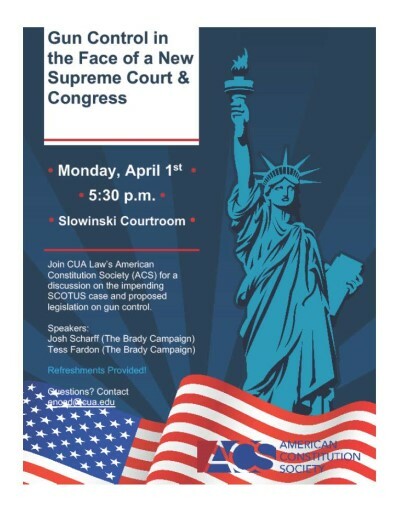 On April 1, 2019, the American Constitution Society hosted an event entitled “Gun Control in the Face of a New Supreme Court & Congress.” The event welcomed the Brady Campaign’s Josh Scharff and Tess Fardon to discuss the serious topic of gun violence prevention. Scharff began by providing statistics on the epidemic of gun violence in the United States and discussed the country’s concerns as being bipartisan. Fardon provided a thorough legal analysis on the pending SCOTUS case on gun violence prevention, New York State Rifle & Pistol Association Inc. v. City of New York, and discussed potential outcomes. Scharff, Josh and Fardon, Tess, "Gun Control in the Face of a New Supreme Court & Congress" (2019). Other Lectures & Events. 19.